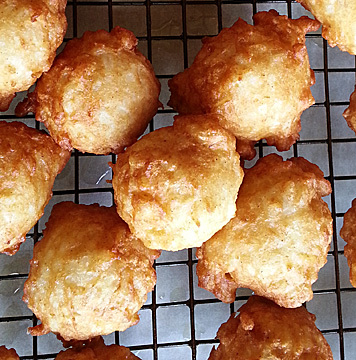 Calas (Creole sweet rice fritters) | Have YOU Ben Starr Struck? At our last FRANK, we wanted to serve a few Creole and Cajun classics that would be unfamiliar to the majority of our diners. After all, everyone knows beignets, etouffee, gumbo, jambalaya, and boudin. Calas (pronounced cah-LAHS) turned out to be a perfect option. 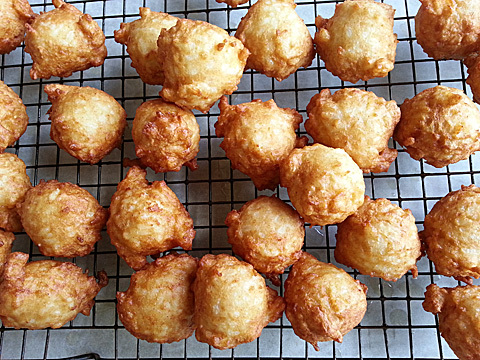 These lovely little yeast-risen rice fritters were typically eaten at breakfast time with cane syrup and cafe au lait. The African slaves, who introduced conventional brown/white rice to America, taught us how to grow it, and how to cook with it, were the ones who originated this recipe…a resourceful way to use up leftover rice from dinner the night before. The Creoles adopted it as their own and it was the go-to breakfast food for them for centuries. Nowadays, calas has faded into near-oblivion, which is a shame, because it’s so easy to make and tastes delicious! Stir to dissolve the yeast, then pour over the rice. Toss well with your fingers, then cover with plastic wrap and let it sit in a warm place overnight. Stir until the rice has made a thick paste. Cover and let it rise for 30 minutes to an hour while you preheat your fry oil. You can use your deep fryer, or just a couple of inches of canola oil in a small pot, depending on how many you need to fry. Preheat the oven to 200F to keep the calases warm after you fry them. You want to shoot for a temp about 350F. Don’t fake it! 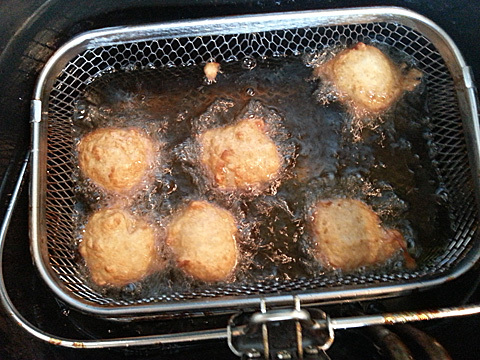 Use your thermometer if you don’t have a thermostat-controlled deep fryer. 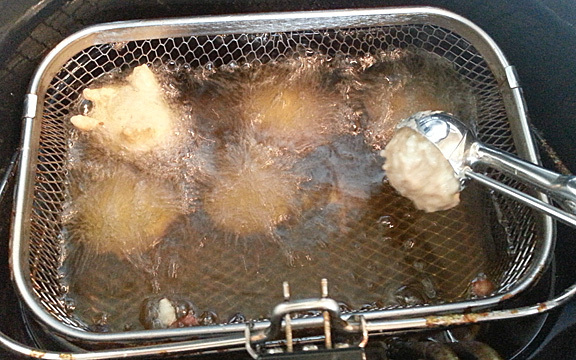 Once they float to the top, keep them rotating in the hot oil so that they cook evenly. When they are golden brown and crisp all around, remove them to a cooling rack turned upside down over a paper towel to drain. Feel free to comment below, especially if your family had any similar recipe they used with yeast-risen rice! This entry was posted in Breakfast, Desserts, Recipes and tagged breakfast, cajun, calas, Creole, dessert, dumpling, fried, fritter, New Orleans, rice, traditional, ways to use leftover rice, yeast. Bookmark the permalink. can i use short or medium grain rice? I accidentally overcooked some rice for sushi. Never heard of these before but they sound so yummy!